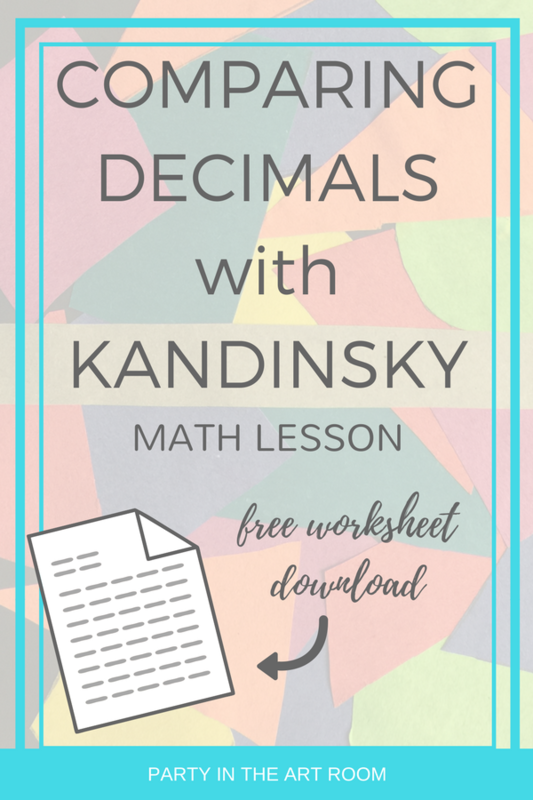 Here's a great arts integration lesson plan for teaching comparing decimals using the work of Wassily Kandinsky. Students analyze Kandinsky's Accent on Rose, which is composed of different repeating and overlapping shapes. 30-Second Look is a great method to use with students to help them analyze the work. Show the students the work for thirty seconds only. Have them write down everything they remember. Then, have a class discussion. Make a class chart to record the responses. After everyone has shared what they remember, show the work again. Add to the class chart with any new observations. 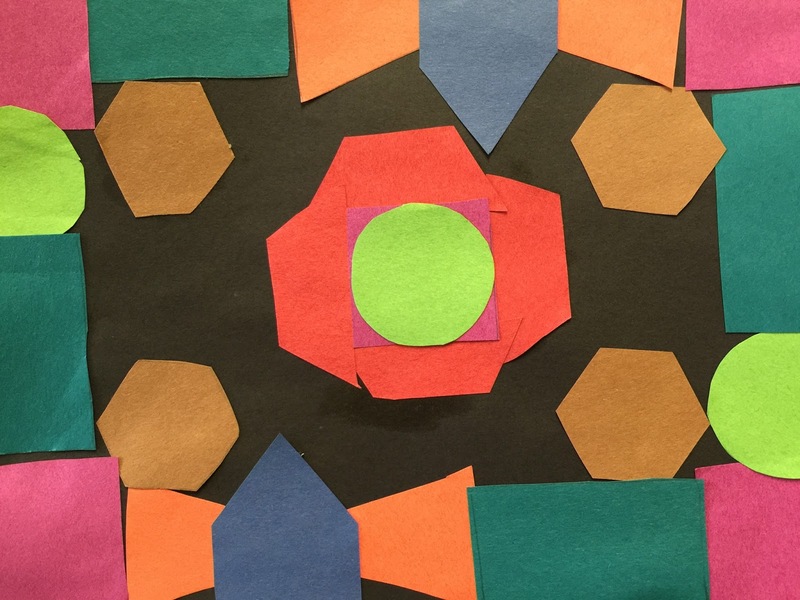 From this activity, it is best to steer a class discussion in the direction of shape as the element of art and repetition as the principle of design. Students will apply these concepts of shape and repetition as they work on their own pieces. There is more than one way to create this artwork. The examples here have been created with construction paper. Students could use scrapbook paper or old newsprint. Students could even make their own paper. These students traced pattern blocks to get precise shapes. This is a great way to differentiate the art part of this lesson. Not all students will need the support of tracing, some might be able to draw their own shapes. They also made their own artistic decisions about how to place the shapes considering repetition and overlapping to their tastes. Students will represent number with decimals to the thousandths place in their artwork. Let's say a student cut out three circles, four triangles, five squares, four rectangles, four trapezoids, two pentagons, and 4 hexagons. Each shape would correspond to a place value on a key (see your free download). For example, the circles might represent the thousands place, triangles the hundreds, squares the tens, rectangles the ones, trapezoids the tenths, pentagons the hundredths, and hexagons the thousands. Thus, the student's number would be 3,454.424, which would be visually represented by how many of each shape that corresponds to a place in the number are included in the artwork. writing in word form and expanded form. Take a look at the variation on this project below. The student used the beige line to represent the decimal. So, the whole numbers are on the left and the decimals are on the right. AND, Kandinsky Dance Curves Resource List (lesson in upcoming post). Get your FREEBIE download instantly delivered to your inbox! I hope you will give this lesson a try. Let me know how it goes. 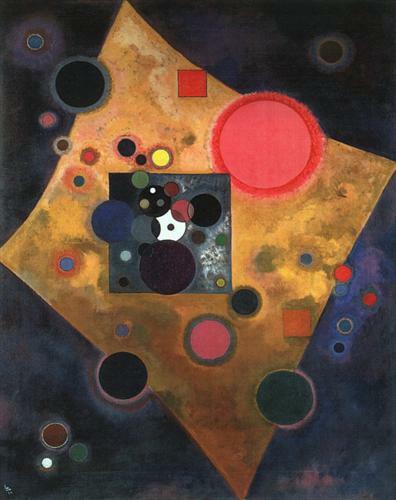 AND, more arts integration lessons featuring Kandinsky (including Place Value with Kandinsky). Click here for more info and to purchase your copy while it is on sale! Affiliate Disclosure: Party in the Art Room may contain affiliate links. If you click one of my affiliate links, I may receive a commission for referral. Please know that I only recommend resources and products that I believe in. We are a participant in the Amazon Services LLC Associates Program, an affiliate advertising program designed to provide a means for us to earn fees by lining to Amazon.com and affiliated sites.